For Hot Sweet Pecans:Butter a metal cookie sheet and set aside. In non-stick frypan, combine first five ingredients. Bring to boil over medium-high heat. Stir until sugar is dissolved, about 2 minutes. Mixture will be bubbly and foamy looking – BE CAREFUL THIS IS EXTREMELY HOT! Add pecan halves and stir while cooking for one and 1/2 minutes. Remove pecans to cookie sheet and spread to separate. Let cool thoroughly. For Gorgonzola Vinaigrette: Whisk together dressing ingredients until combined. 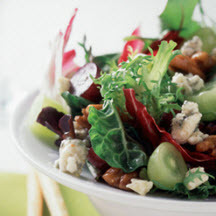 To assemble salad, toss greens with grapes, nuts and vinaigrette. Nuts can be done in advance, keep stored in airtight container. Dressing can be made in advance and stored refrigerated. Nutritional Information Per Serving (1/6 of recipe): Calories 458; Protein 6.5g; Carbohydrate 23g; Fat 40g; Calories from Fat 75%; Saturated Fat 9g; Cholesterol 31mg; Fiber 2.6g; Sodium 592mg. Recipe and photograph courtesy of California Table Grape Commission.